Gutter Damage can leave your backyard flooded, causing potentially more damage to landscaping, decking, patios, and foundations. 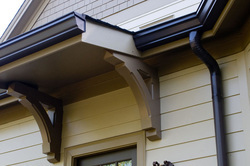 Southlake Roof Repair will repair, replace, and install gutters on your home and business. Common issues we find with gutter systems is leaks dues to age and improper pitch. Leaky Gutters that aren't causing much of a problem can typically be remedied by sealant bought at a local hardware store. In cases where you see water pouring out of seams and holes, it's recommended you call a professional. If you find that leaks are not the problem, but water is standing in the gutter system, this is usually a sign of improper pitch. This mean the Gutters are not at the proper incline for water to flow. If your home or business sits on a level foundation, the gutter system should not be level, but a slight downgrade causing water to flow a specific direction. When foundations shift, this cause gutter system pitches to shift as well, thus causing standing water. This can be fixed by removing and reattaching the gutter system at the proper pitch in relation to the slope of the homes foundation. This method requires specialized equipment, so it's best to call a professional. Southlake Roof Repair had trained and Skilled Contractors that specialize in Gutter Systems. Whether your are looking for repair work or a New Installation of Gutters, Southlake Roof Repair is the place to call. We understand the soils and climate of our area in North Texas and know what products will ﻿last﻿ the longest. We have also perfected the best techniques for installation on homes in our Southlake area. If you are in the market for a new Gutter System or Gutter Repair, feel free to call us for a Free No Obligation Estimate. You can also send us a message using the form on the right. We look forward to hearing from you!